It is worth bearing in mind that London 2050’s Transport Supporting Paper (TSP) has two topics at its heart. The first of these is the implications for transport of the forecast employment and population growth together with where this might take place. The second is how, through planning the city’s future transport system, we might shape the pattern of London’s growth and development to help bring about a more sustainable outcome. We saw in Part 1 that London has been offered less freedom of planning choice than one might have desired, because of how the modelling has been undertaken. Part 1 described that the extra 1.3 – 1.4 million jobs were fixed at the start as largely to be within the Central Activity Zone (CAZ – or the Central Business District to those of us here in LR Towers of an older educational vintage). This is argued within the consultation document to be the most effective match of job location to overall accessibility and economic gain. It’s not surprising, given the existing distribution of rail accessibility across London, for tube, commuter and intercity rail services. The core argument underpinning this is the wider impact of agglomeration (something we have tackled here on LR before), which relies on the dual stimuli of densely located jobs with capacity for skills clusters, and high levels of accessibility. Agglomeration brings with it, however, the danger of a circular argument, or a self-fulfilling prophecy, if your starting and concluding points are the same. It locks you into a radial-centric future development plan, with the seemingly endless requirement for more radial-centric infrastructure (e.g. railways) to satisfy projected travel-to-work requirements. To its credit, the TSP carries a note of caution on this subject, accepting that “there may be a limit at some stage to the density that can be supported within more traditional areas of the CAZ”. As the current Thames Airport news coverage highlights, however, the current Mayor considers that densifying existing locations is entirely the wrong approach when it comes to another topic, airport hubs, which are a classic theoretical example of agglomeration. In this instance, perversely in modelling terms (though plausible in political terms), a radical new location and radical new accessibility requirements are described as the correct choice for an airport. This has caused a substantial infrastructure and expenditure overlay in its own right, within London 2050. In turn this redefines (or perhaps less politely, distorts) the priority, timing, scale and location of major new transport investments – particularly for the other projects aspired in parallel to and after Crossrail 2 and New Tube for London. Of course, expansion of existing airports will bring its own prioritisation of transport investment, but that might be easier to absorb within existing transport investment plans. The Airports Commission will guide us on these matters later in 2015, so this version of London 2050 might have a long or short shelf life. After all job and population changes in East London will also require some new transport capacity in that direction, estuary airport or not. The simple point remains though – if a radical break away from agglomeration theory is considered to perhaps be the right policy for planes, then why not for the much more fundamental distribution of jobs – and their relationship with the potential distribution of population? It is by no means a spurious argument. A parallel London 2050 time warp could be shaped to support a city that is organised around several financial (and indeed social) centres – something known as “polycentrism.” Places such as Croydon, Enfield and Hillingdon might welcome that (and the associated business rates) even if Bromley-esque locations happened not to. Such a London might also be more resilient against some of the travelling problems or other city paralyses which arise from time to time. There is more at risk with nuclear concentration of jobs with the bulk in one zone, though there can also be agglomeration advantages in such clustering. 50 mile LSCC Science & Knowledge corridor (Science and University skills based in Cambridge and Kings Cross/Bloomsbury), with half-hourly non-stop trains taking 45 minutes, and with supporting growth, education and skills patterns at selected locations along that corridor. California’s Silicon campus stretches over much of that US State. San Diego via Long Beach and Bakerfield to Sacramento (the state capital), is about 470 miles. The 90 mile M4/Great Western Thames Valley corridor, Heathrow to Bristol, is one of the most successful economic growth areas in the southern UK. The Government supports skills and economic growth clusters along the 70 mile Oxford-MK-Cambridge Arc, to be linked by East West Rail. The critical feature of the London 2050 employment analysis is that it judges the forecast increase in jobs will want to be located in Greater London, instead of in economically relevant agglomerations – whether wholly within Greater London or along corridors extending beyond the capital’s political boundary. We’re not in a position to critique this further, but it must be borne in mind in the further commentary and London 2050’s own documents – the current London 2050 planning does not take account of employment changes outside the GLA boundary, nor cross-border agglomeration opportunities. Nor does London 2050 seem to recognise that businesses and population have little regard for political boundaries, more for what is right for them at the point of making a decision where to locate businesses or to buy a house. 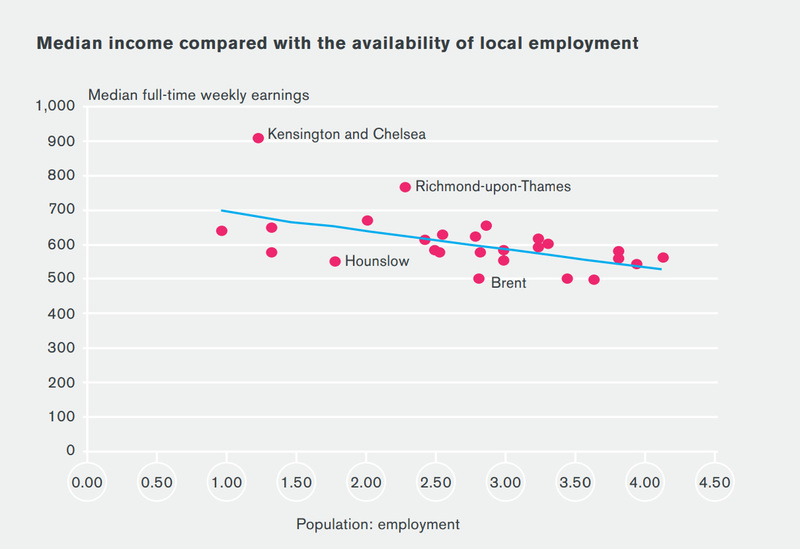 We are asked to accept that the graph shows that areas with more people who work in central London, who have incomes that are significantly above the average, tend to generate greater local employment, as there is high demand for local services in the areas in which they live – and that consequently “this strengthens the case for ensuring there are good transport connections between the main employment hubs and these areas of regeneration”. But the primary employment hub is only defined as the CAZ. It could be argued alternatively that a good level of accessibility to new, valuable jobs located instead in inner and outer London, could also achieve that uplift. London 2050’s willingness to consider new satellite activity zones (see below) shows that a greater variability of jobs location can be considered acceptable – providing that there is a quality transport umbilical to Central London and an adequate density of jobs. It is difficult to believe that radial transport itself is the constraint to having more satellite zones outside Central London. Consider an 8-10 minute timing from the CAZ boundary to Old Oak, Canary Wharf or Stratford, which are the three satellites finally set out in London 2050. Why should that produce fundamentally different outcomes in jobs and agglomeration benefits, compared to the likes of Hammersmith, Clapham Junction or New Cross – all of which have similar rail timings from the CAZ. Similarly the likes of Croydon, Brent Cross, Harrow or Tottenham Hale are not far behind. Indeed there are even places beyond Greater London that can boast broadly similar journey times – places such as Ebbsfleet, Slough, Watford or Stevenage. It won’t be radial rail which is a constraint, it will be more a question of the capacity, desire and the marketing capabilities of those areas to secure higher density development, and which modes will be adopted for local travel to those centres. Public transport demand slightly reduced compared with London Plan land use, with passenger km down 0.5 per cent. These conclusions were consistent with the findings of the earlier work carried out in support of the London Plan and Transport Strategy. It is difficult from a transport perspective to see how Croydon, very well served by rail by any national standard, and already with a number of local feeder rail services plus Tramlink, should not have featured in the final London 2050 CAZ optioneering. If that can’t succeed by London 2050 standards, might there be a problem with London 2050, not with Croydon? If one can’t be positive about outer London jobs stimuli even for Croydon, where does that consign hopes for high value jobs for the rest of outer London? However, it is important to be aware that some outer London Town centres have fared poorly over the last three decades. So back to the factors of capacity, marketing and quality. Consider Croydon again, from that perspective. Croydon has been in decline for thirty years as an employment location. Good rail links haven’t stopped some high-worth head offices going. It bade farewell to Nestlé and others, nor can it compete for back offices that have gone offshore for cost reasons. It is now looking to Westfield retail mall for salvation plus residential. The town centre problems are beginning to bring down parts of the Borough with it, as CAZ workers choose to live in what used to be regarded as the inner city ghetto (Docklands, Clapham, Islington, etc), rather than places such as Wallington or Sanderstead which were previously thought of as quite desirable. Croydon is not an isolated example. Go to other town centres such as Romford, Sutton, Harrow. Offices are being converted to residential as it is hard to find tenants. In comparison the CAZ has got bigger with places such as London Bridge, Kings Cross, Paddington and even Southwark and the South Bank now included within it. And Vauxhall Nine Elms Battersea (VNEB) will continue this. It looks like the London 2050 plan authors can’t see what might realistically change this long-standing trend. The employment model was then rerun for London 2050 planning, including only locations which are close to the fringes of CAZ. This was a “potentially more plausible hub scenario” (page 113). “Significantly increasing the density of jobs at Stratford and Old Oak Common could in these circumstances have the effect of extending the CAZ and enhancing its economic strength, so long as the transport infrastructure is in place to ensure good fast connections which link these hubs to the central area public transport network”. An intensified existing CAZ would represent a New York-esque central area development – much more high rise and high density. 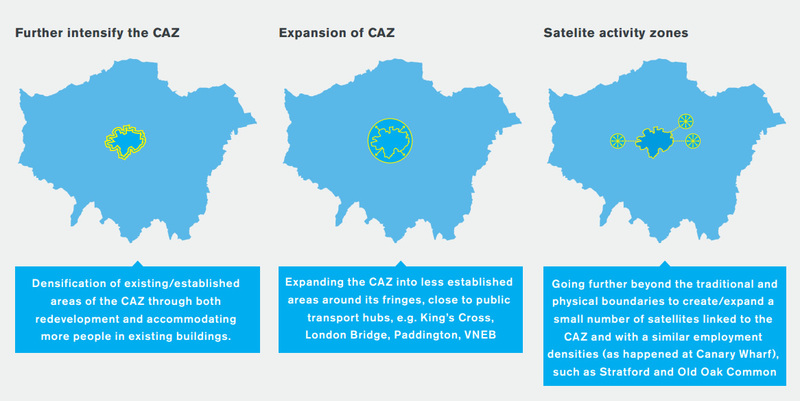 An expanded CAZ meanwhile would support core development zones around major rail termini, following the trend established by the City Fringe and Kings Cross Lands, and also newly accessible developments such as Vauxhall Nine Elms Battersea. Satellite activity zones are also considered, such as Stratford and Old Oak Common, relying on high levels of transport accessibility from Central London and other catchment corridors. From a transport perspective each of these zones has different demand implications and consequent railway requirements, albeit some of these are operational changes affecting service patterns and deliverability rather than maximum demand volumes on individual corridors. The support for most new jobs being in the CAZ might also be taken as bad news for an Outer Orbital railway – unwanted for locating new jobs before it has had a chance to prove itself, even in modelling, except perhaps via Old Oak Common on a SW to NW corridor. The transport system is largely modelled on a fixed forward projection to 2050, derived from existing, planned and proposed system upgrades, and future capacity and investment trajectories. So this starts to look like a Hobson’s Choice – you can have any shape of CAZ jobs provided that the transport authorities can accommodate it on a close variant of the rail network whose infrastructure is already largely fixed or projected. As it happens, the railway network is geared to supporting something of each CAZ proposition – and does already support cross-border agglomeration flows. The greatest pressures can be foreseen at major interchanges, and particularly at termini where large expansion of catchment jobs located close-by, in the CAZ middle option, overlay the projected transfer load envisaged between main lines and tubes. So the railways would face an incubus of extra peak volume, concentrated at key stations which themselves are likely to require major re-investment to achieve adequate passenger handling, and, in some places, additional platforms to maintain or increase train frequencies. Double-ending of stations and multiple passageways at interchanges are predictable – as they are already in place at Kings Cross. There are also implications for the generalised case for through running of main line commuter services across the CAZ, in the shape of more Crossrails or Thameslinks, to increase accessibility of jobs, improve transport and line capacities, and minimise journey times. eventually, higher line capacities achieved with in-cab signalling and moving block circuits, and automatic train operation between stations. We know then, where London 2050 thinks people will work. Where then does it think they will live? growth in areas outside London. In other words, define your political sensitivities and the political and real-politik priorities for the Mayor of the day, and you’ll get your [variable] answers. an Inner London scenario with higher public transport accessibility “could support an equivalent population but the balance of growth between inner and outer London would be at 30 per cent and 4 per cent respectively”. 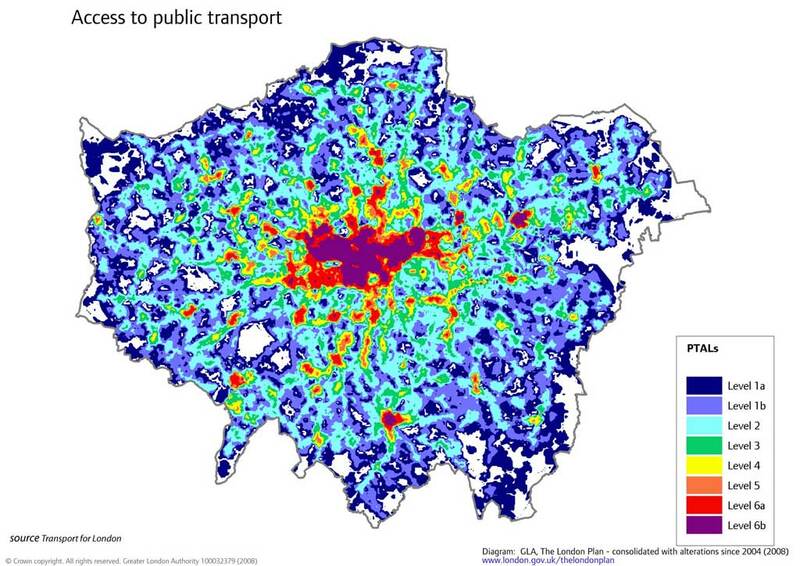 A public transport accessibility (PTAL) map is set out in the London 2050 report. Because of the relative frequency of services, a PTAL-based densification of population would put greatest numbers of additional population along the tube, DLR and high frequency bus corridors. The national rail network is relatively weak for frequency in outer London, except as some locations such as Croydon, which also has Tramlink. The combined PTAL map for all public transport is shown below. It goes on to say that the decisions on higher housing density are paramount, should you want the outer suburbs to secure more rail-based infrastructure. Definitely then a case of the egg first, before the chicken is allowed legs. London’s nominally stable travel rates (between 1.6 and 1.8 trips per person per day, all modes), time per journey (typically within one hour), and distance per journey per trip (currently an average of 10 kilometres) point to the underlying driver of future demand and extra capacity as being population and job volumes. However the TSP acknowledges that there will be subtleties in future decades, with fewer car trips as a proportion of the total because of changes in population characteristics and densities, more public transport trips (up 50-80% by 2050, and particularly rail-based trips at 80%), more cycling etc. This semi-static model for average distances travelled, also does not fit reliably if some of the population chooses or finds itself having to make longer distance commutes from the Home Counties to CAZ employment. The cost of increasing capacity could become high as individual corridors find their commuting elbow room gradually squeezed out. As discussed in the ca. 1969 Prices & Incomes Board report on rail fares, extra commuting capacity incurred a major resource cost which merited differential pricing – alternatively try to find rail corridors with adequate marginal capacity. Also, is it wise for main line capacity relieved by HS2 in the late 2020s and 2030s to be rapidly taken up by more commuters, even if that is a valid option to consider, and, in practice, something which is hard to avoid in a free-market world? How soon before you need HS4, BMLX, GWY, AngliaZ etc (assuming HS3 somewhere in the north? ), with related extra capacity within or across Greater London? As noted below, the TSP looks supportively at the potential of using HS1 as a high speed commuter corridor from East Kent and Hastings (assuming the available line capacity hasn’t been double-allocated also for an Inner Thames Estuary Airport – ITE). The London 2050 preference is for population densification at high public transport accessibility locations (PTAL), such as inner London, or at town centres, but without co-located jobs on a proportional scale that could over time moderate the demand for some radial travel, or at least allow the same radial service to be used twice on the same journey (eg once to Croydon, once from Croydon to Central London). This comes partly from treating separately the future changes to job and population locations. The same multiplicity of use of available capacity already happens to a much greater extent on the Orbital Overground lines, with frequent re-use of the same capacity as people join then alight at interchanges further along the route. So the modelling also has implications for the efficient or inefficient use of transport capacity. We’ve already covered in Part 1 and above why the modelling as adopted is likely to generate a low BCR case for an Outer Orbital system. A full orbital potentially incurs very high infrastructure costs for relatively low additional benefits, in a policy environment which does not support many additional jobs in selected outer London centres, and is undecided about which form of population settlement model to adopt. So an Outer Orbital has not been given any priority nor funding in this version of London 2050. Obviously a new East London cross-Thames rail tunnel would be required. It can be inferred that, to maintain reliability and support existing or improved service frequencies, some extra line capacities could be required at known bottlenecks such as Lewisham and at places elsewhere along the existing networks. Crossrail 2 might facilitate capacity works between Wimbledon and New Malden. The largest additional requirements for new infrastructure, along the routes shown, appear to be on the southern outer R25 route. With some billions possibly required there for tunnelling, and the Treasury imposing additional ‘optimism bias’ cost penalties on project evaluation, it can be seen that not all the Outer Orbital might achieve a viable business case. Some observations have been made that an expanded Tramlink might be better value in outer South London. Paris has chosen to expand its outer orbital tram system. Interestingly, on publication the Outer Orbital was a London 2050 feature strongly liked and featured by media commentators, so maybe there might be a future life for it, but only to be justified incrementally. TSP page 90 says that “in the longer term, there is potential for more significant expansion of the light rail/rail network to support higher densities. For example, there may be a case for providing some new orbital rail based capacity for key links in outer London. 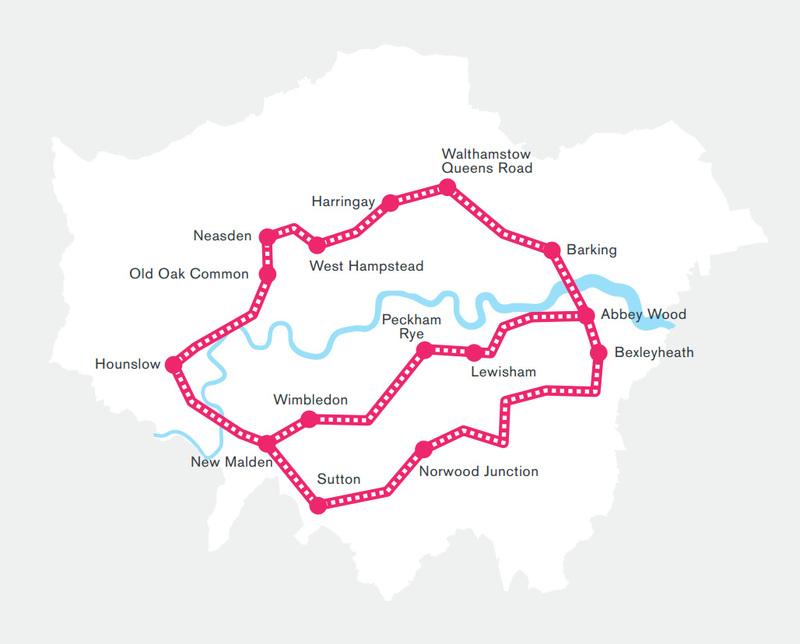 An option for doing this could involve an extension of Overground services in stages, creating some new links initially where most feasible and joining up existing routes over time”. The TSP proposal for a western outer Overground from Hounslow via Old Oak to Neasden and Brent Cross, and the further uprating of the GOBLIN route (both set out in London 2050, pages 145 and 153), might turn out to be the first tentative phases of such a railway. For example if Croydon were to become a CAZ satellite area, as it is only 12 minutes by Thameslink from London Bridge, then there might be an improved case for southern orbital access supported by an upgraded Tramlink or heavy rail. But Croydon would have to want the increased jobs density to pass the London 2050 exam question on overall economic performance, described above, quite apart from any stimulus from PTAL-based or town centre population growth, also required upfront by London 2050. The modelling topic shows that even the preferred spatial outcomes will be sensitive to political issues. The politics of generalised increases in densities will be an important factor in how London actually evolves. The risk of ‘semi-detached’ outrage, if City Hall was seen to be proposing across-the-board transformation of suburban housing densities against local sensitivities, was commented on in our Part 1 article. Some (but not all) outer boroughs may desire more jobs locally than the Mayor envisages in the CAZ-aligned plan. City Hall has shown in its modelling that the most widespread overall impacts to existing suburban streetscape are by maintaining existing policies. Fewer Borough vs City Hall political risks might arise by explicitly targeting high PTAL or town centre areas, providing those policies themselves carry more popularity (or fewer disagreements or higher affordability). It is unlikely that a high level of residential car parking could be permitted in such zones, in future decades. That might have some political impact in outer London, even if, over time, urban car ownership trended towards car sharing. The differential politics between Borough, City Hall and Whitehall/Westminster need to be factored in. Devolution of taxation is one thing, and City Hall urgently needs some of that for London 2050 funding increases, certainly not later than 2019-20 (ideally much sooner). The Chancellor’s visible support for Northern infrastructure such as an ‘HS3 Zone’ might give a ray of hope for positive ‘North AND South’ funding politics, rather the more typical ‘North VS South’. However London Boroughs might be worried that business rates could become the exclusive property of City Hall for future infrastructure investment. Quarks come in six different ‘flavours’ – left, right, up, down, strange and charmed – so it might be that the latter two, represented by economic growth and social quality, will be stronger forces than the standard left and right party politics and north and south political geography, especially after a new Government in 2015 and the Mayoral and GLA elections the following year. But would you bet on it – if a week is a long time in politics, then what is two years? Also, if one is balancing sources of investment funding, how much could or should London then be asked to pay towards its new infrastructure, out of its corporate, business and residential pockets and, just possibly, from other funding sources such as devolutionised local sales taxes, or a revised congestion charge scheme? that parts of central Government (itself a combination of departmental silos) might be uncomfortable about a London Government being an even larger power in the land than Ken and Boris have already asserted successfully. The fourth, self-imposed burden for the Mayor is the question of a London Airport Hub. We’ll set aside the specific arguments for and against the location of a Hub, other than that a new ITE (Inner Thames Estuary) Hub imposes a requirement for additional transport infrastructure – more so as it is further from England’s main internal economic corridors. One accepts that Heathrow and Gatwick’s present trunk transport links by public transport are themselves weak other than to/from Central London. This London 2050 Part 2 article was written before the Airports Commission announced that the ITE Hub has been rejected for short-listing, a decision which was published on 2nd September. Because London 2050 still contains the proposals, and is out to consultation until 31st October, it remains relevant to review the proposition from a transport context. The Mayor also has not given up on his aspirations. He maintains that the politics of extra runways at existing airports will ensure that the future Government from May 2015 will still need to consider an ITE Hub, against the short-listed choices of Heathrow (two options for a third runway) and Gatwick (a single option for a second runway). So the article’s text is unchanged below. capacity constraints at [Heathrow] airport mean that many routes, including most UK destinations, have been displaced or lost frequency in response to emerging needs. The policy worry is that UK may be about to make a multi-billion investment decision chasing a chimera. The proposition is that a world-wide hub is no longer the way aviation is developing. Just as Heathrow is widely accepted as the right location for a Europe-America staging post, global region hubs are evolving to the point that Middle East states might turn out to be the right strategic staging point for Europe to access the Far East, by maximising bulk transfer volumes there, alongside specific point-to-point volume flows served by direct flights between Europe and the Far East. The authority of that viewpoint, Vernon Murphy – a widely respected aviation director and senior railwayman – has sadly just died. His latest and last contribution was published in the August 4th Business Travel News. Here at LR Towers, we think it is well worth reading. It is not for the Mayor to ‘go it alone’ on the location of an airport hub. Currently there are two short-listed options at Heathrow and one at Gatwick, with the Mayor’s ITE Hub trying hard to stay in the race. There are also the views of the aviation industry, apparently not too keen on a location there for commercial and operation reasons, and other stakeholders in the UK to take into account. The Airports Commission will recommend in June what are the best options in its view. The political risk is that Government funding support for a harder-to-reach ITE Airport, if it were recommended by the Commission, might not be considered too kindly by regions already grumpy about London’s spending levels. A greater percentage contribution from the aviation industry and from Government might be available for development of Heathrow and/or Gatwick – with the total transport plus new housing and other bills also being lower that the estimated ITE’s £70-90bn (according to some commentators, when combining transport as well as housing and other infrastructure). Would London be willing to stump up for all of the ITE Hub costs? A July 2014 Jacobs report for the Airports Commission on Surface Access Impacts sets out an assessment that the only realistic ITE rail project by 2050 is Option 4 in their report. Other options were not realistic because of London’s forecast jobs and population expansion by 2050. Option 4 included: HS1 express spur, Crossrail southern extension, rail connections from South Essex and North Kent starting at Grays and Strood stations, a direct Waterloo-Bromley South-Swanley service, plus a new Crossrail-type express service from Waterloo via London Bridge, Canary Wharf and Barking Riverside. Rail cost is up to £27bn including optimism bias, and Jacobs warn that there are significant risks “likely to require costly solutions” (Jacobs report, page 6). Roads required amounted to another £10-17bn. These infrastructure costs exclude significant environmental impacts (birdlife estimate up to £2bn for relocation), and all other infrastructure needs including housing and services such as schools, local roads, hospitals etc. The difference in spend – and the timing and prioritisation of that spend – might be critical for other ‘pure’ London travel expenditure which turned out to be essential for the well-being of a London in 2050. £70-90bn on one aviation project is a tidy sum. the £500bn that Arup shows as the cumulative transport spend for 2011-50, in the quinquennial diagram in the main London 2050 report. An aviation hub is a big spender on either basis. 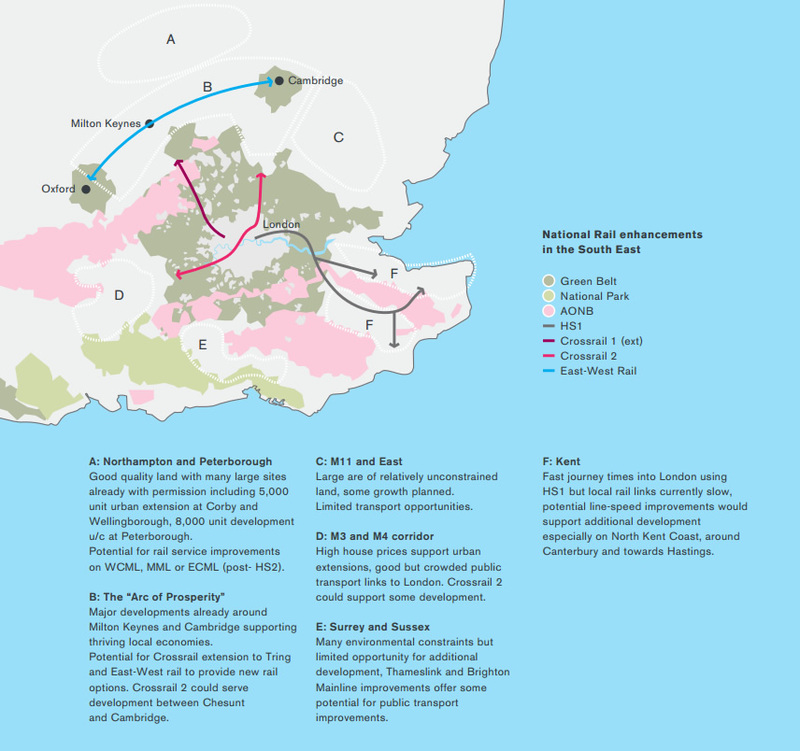 Spatially, it makes some but not much difference to the scale of London’s fundamental east-west ‘core activities’ sausage shape, whether there was an Estuary airport as part of the Thames Gateway expansion and/or a Borisian Heathrow civis maximus for housing and industry, or a larger Heathrow airport allied to Thames Valley access. 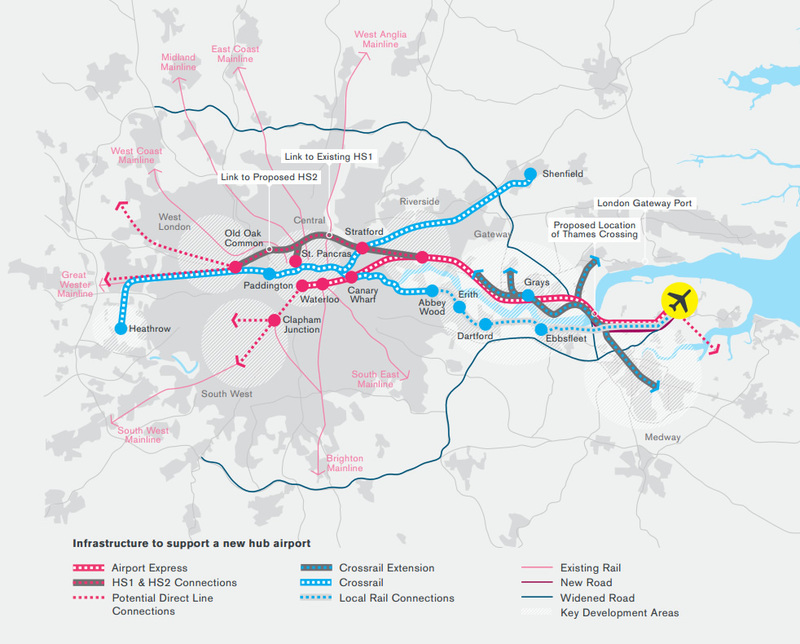 A more gentle, but in the long term more radical change in London’s topography, particularly for transport, could be to see Gatwick supported as a second hub by the Davies Commission, in partnership with Heathrow. The current version of London 2050 hasn’t allowed for that. Ultimately, the political decision about a hub, and where, will be a matter for the post-May 2015 Government. 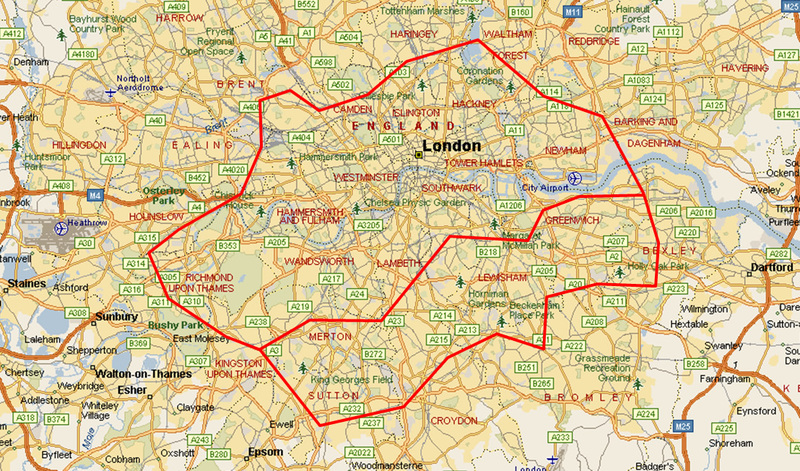 E: Greater London or beyond – how many people, where? The TSP recognises that, in practice, some of the forecast extra population is likely to have to be housed outside the existing boundaries of the city. The TSP says it makes sense to explore opportunities close to London to minimise costs, avoid extending journey times and reduce environmental impacts. This could be achieved through facilitating ‘fingers or nodes of growth’ focused on existing, enhanced, extended and new transport corridors and stations. New stations “could offer key foci for sustainable growth”. If any development was to be allowed on Green Belt “it must be linked to existing or new rail capacity and where the land is of lower amenity value”. There are also “potential options for new ‘garden cities’ just beyond London’s boundary. The only committed scheme to date is at Ebbsfleet”. Apart from within this eastern corridor, opportunities in contiguous areas are likely to be constrained, which means there may be a case to bring larger scale but less well connected growth areas within reasonable commuting times of central London. There might be economic and regeneration opportunities in this scenario if the additional housing is located in urban areas further afield with relatively high levels of deprivation. 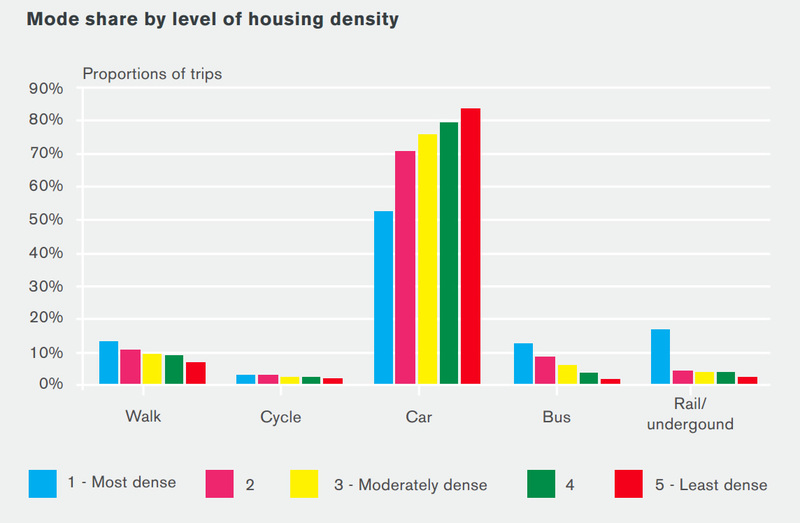 The TSP has considered a scenario which increased densities on residential land in a range of areas outside London considered feasible to enable substantial increased commuting. This scenario supported a population increase of about 1 million in the region surrounding London (correspondingly, London’s population growth was reduced by 1 million). More detail is provided in TSP pages 123-126. In this scenario, there would be less traffic pressure within London as a result of the lower population growth, but the main line rail network would face “additional crowding pressures as a significant proportion of the dispersed population would commute to London jobs, leading to longer average trip distances and increasing demand on commuter lines. There would also be challenges in those areas outside London where it will generally be more difficult to embed sustainable travel patterns”. Most comments speak for themselves. The map makes a useful point about a 70 mile agglomeration science and skills arc from Oxford to Cambridge, underpinned by East-West Rail. Zone C, east of the West Anglia main line, is considered limited for housing capacity principally because of the absence of a good rail corridor. London 2050 does not propose a new corridor there. A respected commentator, Barney Stringer, has recently published an article asking whether administrative London is too small, with mapping showing the areas outside London where a high proportion of local residential population commute to work in the Greater London area. This has stimulated some thinking in LR Towers, about whether it is really the railways which have the greatest impact on commuting proportions outside London, or the motorway and main road network. The mapping shows that north-east of London has over 50% of its population working within the GLA area, yet there is only the Central Line (shown all the way to Ongar). That town is no longer a rail commuter zone, and was scarcely important even when on the tube map, being at the wrong end of an infrequent shuttle. After accepting the Central Line’s impact to Epping, one is forced to conclude that a lot of the blue zone is really about local commuting by cars to jobs just inside Greater London, or further along the GLA area via the M25. Further out, rail tends to achieve light grey or dark grey proportions – a fifth to a third, but generally not over 50%. Looking in more detail, with additional mapping, at the classic ‘Metroland’ NW of London territory, shows again that, in the deepest Chilterns well away from the Joint Line via High Wycombe or the Great Western, there is still ‘blue’ high proportion commuting to London – which again must be car-based. Places such as Reading don’t even achieve 20% of residential population commuting to London, despite the high speed train service, because of the large local jobs market. There it will be the absolute number of commuters which matters more for their impact on railway capacity. Thus London’s impact on the Home Counties is road-related as well as railway-related, but above all it is jobs-related. Greater emphasis on jobs in Outer London would increase the reliance on car commuting – not something the GLA is keen on – whereas emphasis on an expanded CAZ would increase the reliance on rail commuting. Better accessibility. Anticipating and managing the travel requirements of a changing population, with a fourfold increase in the number of Londoners who are over 90 years old by 2050. Alongside this is an increasing age on average when people reduce activity and travel rates, with more older people travelling more extensively than in the past. TSP aims for about 40% of passenger journeys to be fully accessible for people with reduced mobility by 2040 (TSP page 139), with expectation of a continuing programme until all stations in London offer that capability. More active travel. Encouraging greater physical activity by people, reducing obesity, and encouraging less use of cars. There has been a shift in attitudes and behaviour in relation to car usage in central and inner London over the past decade. In outer London, however, traffic has been increasing post-recession. The TSP says “a policy-driven shift and pressure on other modes could see an increase in walking relative to population growth, of perhaps 40-45 per cent, while the aims for cycling are to reach levels seen in cities such as Amsterdam and Copenhagen”. Better places. Transport infrastructure must help “support, not undermine, place-making (viz Westway, for example)”. The quality of the transport assets “needs to be commensurate with a world city. The city needs iconic spaces and welcoming places, thriving high streets and safe, calm, social residential streets and to mitigate the impacts of strategic roads on neighbouring communities”. Reducing transport impacts. This topic focuses on several elements: freight movement and better logistics; low emission vehicles becoming the norm by 2050, by when a minimal role is envisaged for conventional petrol and diesel vehicles. We’ve also listed here better road safety, although it is set out separately in the TSP, because it is all to do with transport impacts. The aim on that is to reduce the numbers killed and seriously injured by 80 per cent, by 2040, and to continue the reduction beyond then. This is a challenging objective to achieve for pedestrians, cyclists and motorcyclists, particularly if one seeks also to create better places at the same time. It points to further limits on the speeds and general rules applicable to how, when and where cars, taxis, buses, vans and freight are driven, and with any road segments of light rail. Next stage is Part 3, when we will look at the second element of the Transport Support Paper – the transport options which can help shape the pattern of London’s growth and development. 1. Given that “London” in 1939 meant the old London County Council area, it can’t be easy to compare populations then and now. Are there accurate figures for the 1939 population of what is now Greater London? “Motor buses had largely replaced horses” in 1939″ is a bit of an understatement. The last horse bus ran in 1914. If there was one fact drummed into me in primary school in the 1950s it was that ‘London’ had a population of 8 million. Clearly they were counting way beyond the ‘County’ area to reach that figure. It is not too difficult to make comparisons between the 1939 population and now, as most of today’s boroughs are composed of two or three pre-1964 ones. One of the many useful things we learned in geography at school is that cities (worldwide) are almost always functionally larger than the administrative area which defines them – administrative boundaries are usually very tightly drawn – think of New York City, bordered on the east by New Jersey/Jersey City, which – I would guess – is almost never included in ‘official’ counts of the New York population, as it is a different state. Similarly, London’s sphere of influence (and thus effective population) spreads way beyond the current GLA boundary. “Population of London” usually meant; pre-GLC, not the LCC county area, but the London numbered postal districts ….. I would *guess” that there are something like 12 million inside the M25, now. You have to remember that our statistics & reporting are often thought to be under-reporting such things, for various, sensitive, “political” reasons that are not relevant to this discussion. @timbeau – the old LCC area never got much above 3-3.5m population and even in 1889 didn’t include the continuously built up conurbation (eg the various county boroughs round its periphery. So there can be no grounds at all for assuming that that area is relevant to the discussion. You are also right to point to what appear to be some other serious howlers. For a well written summary of transport modeling history in Britain see this paper http://www.its.leeds.ac.uk/fileadmin/user_upload/News/OECD_ITF_Worsley_Dec_2011.pdf.